Water is usually recognized as a universal solvent. Given enough time, drops of water will cut through mountains of solid rock. Imagine what happens when you crank up the pressure to 60,000 psi! A stream with that kind of force behind it will cut with ease through glass, plastic, aluminum and even steel. 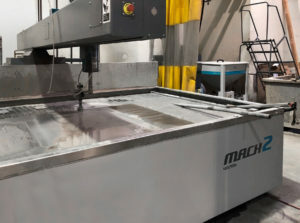 In fact, the technology is so useful that we just plain wore out our old machine and recently replaced it with a brand new Flow Mach 2 waterjet system. Why would we use plain old water instead of a space-age laser cutter? While a laser is faster (we use ours all the time), it can only cut through about 3/8” of material at a time. There are no such limitations on the Flow Mach 2. Waterjets are capable of cutting up to 6” (150 mm) of metals and 18” (460 mm) of other materials. With the 100 hp Intensifier ultrahigh pressure pump, we can stack up raw stock and the waterjet will slice through multiple layers at a time, which is great for productivity. In fact, the only thing stopping the stream from cutting right down to the shop floor is the software, which determines the length of the cutting jet. 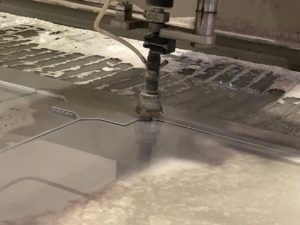 Waterjet cutting is also the preferred method when the materials being cut are sensitive to the high temperatures generated by lasers and other methods. The new Flow Mach 2 is more reliable as a newer model, so there’s no downtime for repairs. That reduces logjams in our process and enables us to give you faster turnarounds. Technology has also improved since we bought our old machine. That translates to quicker setup times. The Flowmaster® Windows®-based software allows us to quickly import multiple file formats (even pictures) into the system for processing. We can even design projects right on the built-in screen. The next step is to input the material type, thickness and edge quality. Then, it’s a matter of pressing the start button and watch the waterjet go to work. What about accuracy? It was definitely a selling point when we were looking for a new machine. The Flow Mach 2 specs call for repeatability of within 0.0025” (0.064 mm) and linear straightness accuracy of ±0.005”/3 ft (±0.13 mm/m). If you have any other questions on how our waterjet services can help the customization of your next line, contact us.